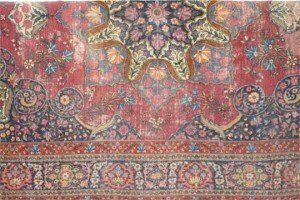 A Tabriz pattern carpet, central medallion on a magenta coloured ground, dark blue spandrels, border with guards. 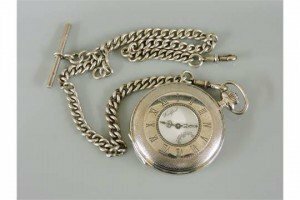 A sterling silver Woodford half hunter pocket watch, with engine turned decoration, suspended on a sterling silver Albert chain. 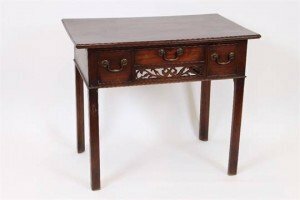 A George III mahogany low boy, rectangular top fitted with three frieze drawers over a fret panel, square legs. 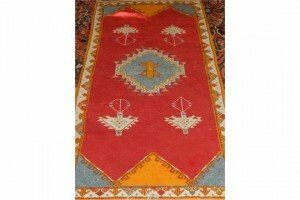 A red ground Moroccan rug, decorated with stepped medallion to centre, within cream ground borders, fringed to one side. 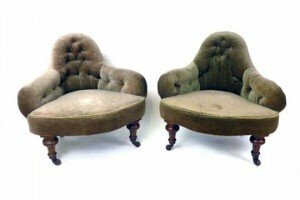 A pair of Victorian walnut and button upholstered corner chairs, on turned and fluted legs with ceramic castors. 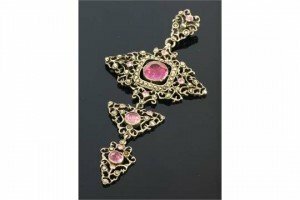 A Georgian silver, paste and marcasite set pendant, circa 1800, a pierced lozenge shaped plaque with a foil backed pink paste, set to a cushion shaped frame of marcasite, an articulated pierced triangular plaque below and a spear shaped one below that, all similarly set with foiled back pink paste and marcasite, concealed hook to the back with detachable matching bale. 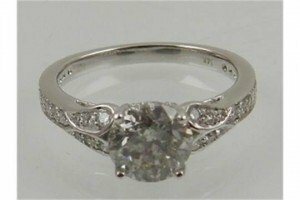 A 14 carat white gold and diamond ring, the round cut stone of approx. 1.50 carats. 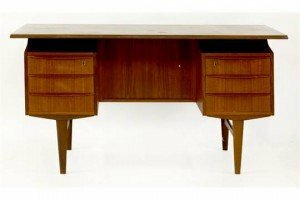 A Danish teak desk, with a floating top, with three drawers either side, the reverse with a cupboard flanking bookshelves. 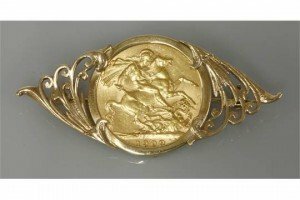 A full sovereign, dated 1909, in a 9ct gold brooch mount. 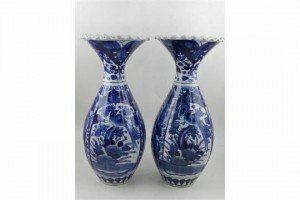 A pair of Japanese blue and white porcelain baluster vases, decorated with panels of birds and flowers. 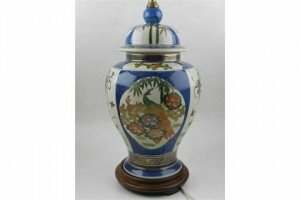 A large Japanese ginger jar, converted to a lamp, hand painted with each quadrant decorated with: peacocks amongst peonies, wisteria and bamboo, bears Kutani underglaze back stamp to base. 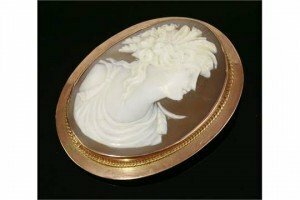 An Edwardian carved shell cameo gold brooch, circa 1910, with the profile of Flora in white to a light brown ground, the cameo rub set to plain frame with a twisted wire border to plain outer frame. 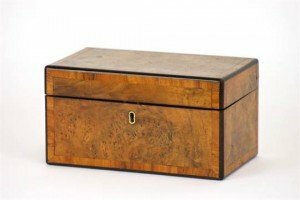 A Victorian walnut oblong shape tea caddy, with cross-banding, two section interior. 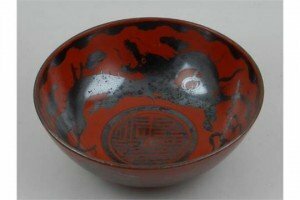 A mid 20th century Chinese red ground porcelain bowl, the interior decorated with dragons chasing flaming pearls, the exterior with phoenixes amongst clouds and scrolling foliage, bears two character mark to base. 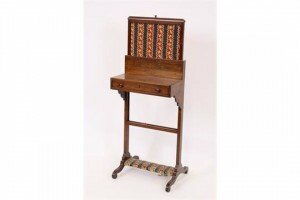 A Victorian rosewood cheval screen, with gros point needlework panel, fitted with a single drawer, standard ends. 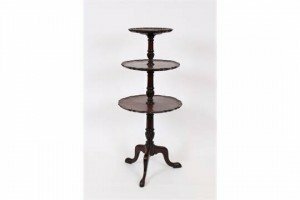 A Victorian mahogany three tier whatnot, moulded pie-crust outlines, baluster and semi-fluted column, tripod legs. 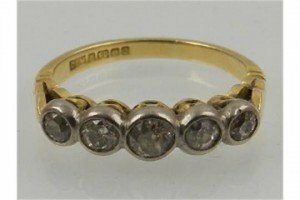 An 18 carat yellow gold and diamond ring, the five round cut stones of approx. 0.80 carats combined. 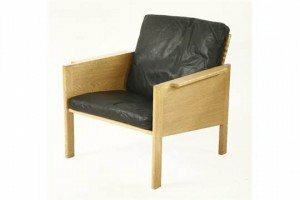 An oak art deco style armchair with a wicker back and black leather seat and back. 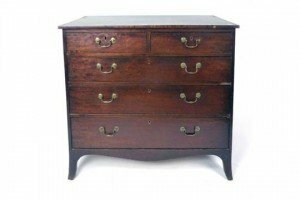 A Georgian mahogany chest of two over three graduated drawers, with ebony line cross banding over a shaped apron and splayed feet. 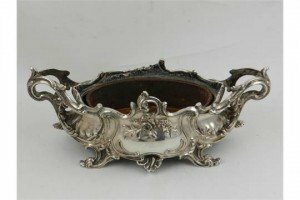 An 19th century Rocco style silver plated twin handled tureen with original lead lining, decorated with scrolling foliage, raised on four feet.